Description: THIS IS A 1940 CODE 42 (MAUSER) NAZI GERMAN LUGER RIG, 9MM. 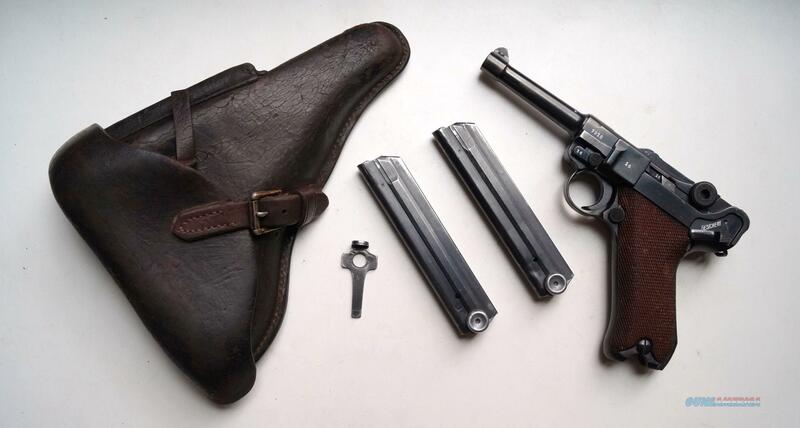 THE LUGER IS IN VERY GOOD CONDITION, NUMBER MATCHING (THIS INCLUDES BOTH MAGAZINES AND BOTH GRIPS), VERY GOOD BORE AND GRIPS, MECHANICALLY CORRECT AND TIGHT. THE RIG CONSISTS OF THE LUGER, 2 NAZI MARKED NUMBERED TO THE GUN MAGAZINES, 1 ORIGINAL NAZI MARKED 1940 DATED HOLSTER AND 1 ORIGINAL NAZI MARKED LOADING TOOL. A VERY NICE WWII NAZI GERMAN LUGER RIG.